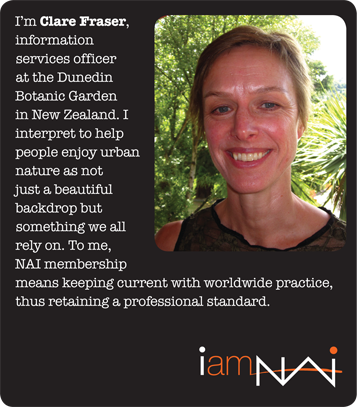 Individual membership in NAI is the best investment you can make in your interpretive career. It gives you access to a large network of cultural, natural, and historical interpreters across the globe. Plus, it's a great value. NAI offers an assortment of individual membership options, below you will find information to help you pick the membership best suited for you. If you are already a current member wanting to renew your membership without any changes, click here. Please note: After signing up for membership, you will need to wait one business day to register for any event as an NAI member. Memberships do not become active until close of accounts on the following business day. Discounted NAI National Conference Registration, rates based on current membership level. Volunteer opportunities which include even steeper registration discounts for the National Conference. Access to scholarships - NAI offers professional scholarships for conferences, workshops, and training events. Discounted member pricing on all NAI training & certifications. Discounted registration for Regional and Sectional Workshops and other events held by NAI Organizational Units, pricing based on current membership level. Ability to run/serve in organizational leadership positions (national, regional, sectional). Discounts in the NAI Association Store (10-20% off retail pricing on all books in the store). Option to make your membership green, "green" memberships are delivered completely electronically and no materials will be sent via regular mail.